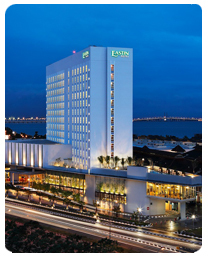 Eastin Hotel Penang features 328 meticulously decorated guestrooms and equipped with modern amenities for the comfort and convenience of the discerning business and leisure traveler. Deluxe Hill View, Deluxe Sea View and Eastin Deluxe, facing the verdant green hills or the shimmering blue sea and Pulau Jerejak, home to tropical rainforest that’s over 130 million years old or looking out onto an elegant landscaped gardens. Rollaways and cribs (infant beds) may be available and should be requested at the time of booking; fee may apply. Special requests are subject to availability upon check-in. Special requests made via this Website cannot be guaranteed and may incur additional charges. e. Pets are not allowed.